K-9 Stark was deployed by Washington County sheriff's deputies to track down Ramon Zendejas-Holt. 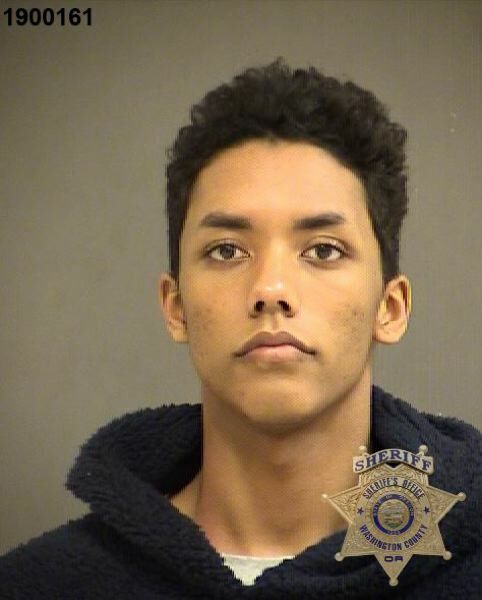 A 19-year-old man was arrested early Friday morning, Jan. 4, on suspicion of breaking into cars in the Bethany area, the Washington County Sheriff's Office said. Ramon Zendejas-Holt was found hiding in a backyard by K-9 Stark, one of the county's tracking dogs, after a 15-minute search for three people reported to the Sheriff's Office as "car prowlers" just after 2:30 a.m. Friday, according to the law enforcement agency. The Sheriff's Office said it received a report of three people trying to enter a vehicle in the 6000 block of Northwest Calypso Terrace and then running from the scene. Both Zendejas-Holt and a Volkswagen sedan apparently belonging to him were found after deputies and K-9 Stark searched the area. The Sheriff's Office noted that "two females" were also found inside Zendejas-Holt's car. Their names and ages were not released, and it is not clear whether they will face charges. Zendejas-Holt allegedly had a wallet taken from an unlocked car that was parked nearby in his possession when he was arrested. That wallet was returned to its owner, the Sheriff's Office said. A "large quantity of foreign currency" was also discovered inside Zendejas-Holt's car, according to the Sheriff's Office. The origin of that money is unclear, although deputies believe it was also stolen from an unlocked vehicle. Anyone with information on the recovered foreign currency is asked to call 503-629-0111. Zendejas-Holt was booked into the Washington County Jail Friday morning. He faces charges of third-degree theft and unlawful entry into a motor vehicle, along with an outstanding felony warrant for burglary, according to the jail website.